3 What skill level is required? This project configures your Raspberry Pi to share files with any other computer on your local network. You can add a large hard disk to the RPi and use this to store your important files/photos/videos in a central location. The files on your RPi can be easily accessed from any type of computer which is connected to your network, for example a Windows PC, a Linux PC, A Mac, a smartphone, etc. In a classroom, each student can have access to a private area, and also a public area for sharing files. Warning: Make sure that you store your important files in more than one location. If the hard disk connected to the RPi becomes faulty, you may not be able to access your files. Low-power NAS. This is used as a safe or convenient place to store files for very occasional access. The priority is on low cost and low energy usage. This guide is suitable for this type of NAS. High-power NAS. This is used to provide instant access to files or to stream HD video. The priority is speed. This guide is NOT suitable for this type of NAS. A Raspberry Pi, model B. A boot SD card for the Raspberry Pi. A large USB-connected hard drive. An Ethernet cable to connect to the local network. The RPi is configured as a Samba server and can expose its files to any Samba client. Samba was originally a Windows-only protocol named Server Message Block (SMB), but has become popular for other operating systems. There are other methods possible (for example ftp) but Samba is very popular because it is built into Windows and Mac OS X, and is very easy to install in all versions of Linux. The end effect is that the PC user will be able to read and write to a new drive which appears to be locally-attached but is actually attached to the RPi. Note that Samba is is very easy to use but is not suitable for high performance. You may not be able to access high-definition video quickly enough using Samba. This project includes instructions to configure the Samba server (where the files are stored centrally) and the Samba client (the user's computer). You must follow the instructions for one of the following servers and at least one of the following clients. To follow the instructions below, you must enter commands into a terminal. You must open a terminal before starting the instructions below. If necessary, search the internet for instructions by using search terms like "open terminal Gnome" or "open terminal LXDE" etc depending on your chosen desktop environment. You may find it useful to open a web browser on the RPi so you can copy commands from this web page and paste them into the terminal. This saves a lot of work and errors. Most terminal programs allow you to paste by using a menu selections "Edit" then "Paste". If you do not understand a command, do not paste it in blindly. You can learn more about commands by reading the manual, by using the "man" command. For example, to find out more about the mkdir command, give the command "man mkdir". Press "q" to exit the man program. A lot of commands start with "sudo". The sudo prefix allows a normal user to enter commands which will affect all other users of the system. where a, b, c d and n are replaced by numbers. If you do not see the above response, you do not have an internet connection, so this must be fixed before you can continue. Answer by pressing "y", then the [enter] key. Make a copy of your samba configuration file, just in case something goes wrong with later instructions. Note: This section is optional, but highly recommended. It forces the samba server to ask for a username and password before allowing another computer to connect. Note that you must use the arrow keys to move around in the nano editor, you cannot use the mouse. Restart samba to use the new configuration file. Configure samba to allow each user to access his home directory. You will be asked to enter pi's password twice. You will be asked to enter john's password twice. If you have more than one user, you may wish to define a public area where everybody can share files. This section is optional. After reading the above tutorial you will want to tweak where your drives are mounted so that they mount in the share area. First create a directory then mount the drive there. Where sdxx is where your drive is in the file system's device hierarchy. i.e. /dev/sda1 . Again, sdxx is where your drive is in the file system's device hierarchy. i.e. /dev/sda1 . A Windows PC uses Samba automatically, no extra software is required. Enter the path to the RPi and click on "Finish". The path is in the format \\computer_name\directory. In this example, the computer name is "bigdisk" and the user wishes to attach to the directory "john". Note that you may also enter the computer name in IP address format, such as "192.168.0.2". If you enabled security on the RPi server, you will be asked for a username and a password. This must be a valid username and password on the RPi server. To access a public area, any username is acceptable. 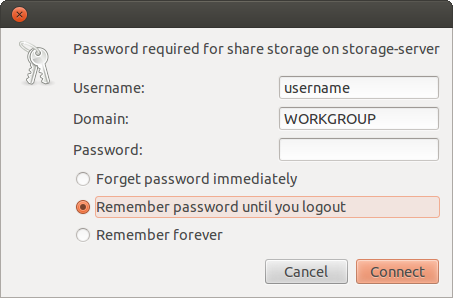 To access a private area, the username must match the last part of the folder path (the part after the \ character). Note that a Windows user can attach to multiple network drives at the same time. It is quite common for a user to attach to his private files (commonly drive H: is used to represent a home directory) and also attach to a public storage (commonly drive P: is used to represent a public drive). 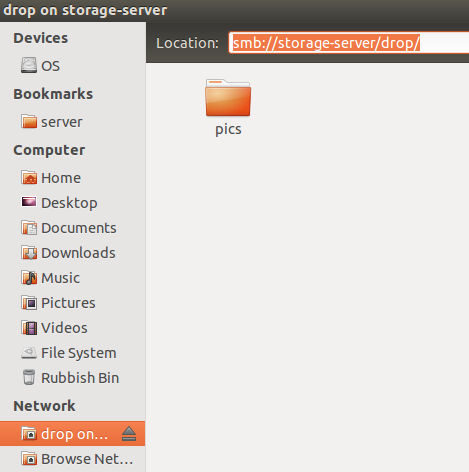 For file managers to successfully mount shares under GNOME and XFCE environments, gvfs backends (debian/ubuntu package gvfs-backends) needs to be installed. 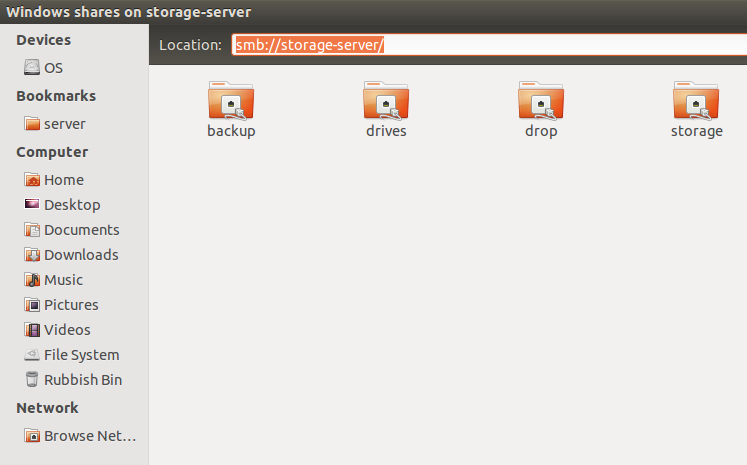 For KDE, a file manager such as Dolphin and working KIO slaves (usually installed as part of KDE) are required. Shares can be accessed under Dolphin in the same way as Nautilus or Thunar. if the server details are in /etc/fstab. Don't forget that only root can use the 'mount' command to access shares, unless the 'user' option is present in a share's /etc/fstab line. The 'fusesmb' command is another way of mounting shares at user-level, but is not as reliable and requires configuration beyond the scope of this wiki. As with most OS X stuff the "it just works" fits this one. As long as; the Linux and Mac networking is setup right with both boxes on the same network and the "Finder Preferences" on the Mac is set to show "Connected Servers". When you open the "Finder" on the Mac the R-Pi's host name will show in the right of the finder window under the heading "SHARED". When you click on the name for the first time a message at the top of "Finder" window will show on the right "Connection Failed" with a button on the left marked "Connect as" press the button and the Mac will ask for "User name" and "Password" use the one set in the "SAMBA" setup and the shared discs will appear in the "Finder". There are multiple Samba clients for Android. The following shows only one example called File Expert, but you can search for the text "smb" in the Android Market (Google Play) to find other apps. Install the app "File Expert". Open the app "File Expert"
Press the "+" on the top right. Set computer name to "raspberrypi"
Click on the server named "pi" in the "File Sharing Servers" list. This page was last edited on 22 November 2012, at 14:25.